Flying Fifteens took the first three places in the Hong Kong Yacht Club’s Nations’ Cup on Saturday April 27. Phact or Phiction, a Flying Fifteen helmed by Simon Pickering representing Philippines, was the winner in a time of 2:39:55. She out-raced the other 75 boats in the fleet that represented the 18 nations, who battled for Nations’ Cup honours on best corrected time over a Victoria Harbour to outer Harbour reaches return course. Other Flying Fifteens that had good races were: Tchaikoffsky, helmed by Howard Williams (Wales), who finished second; Japan Fries, with Akira Takada (Japan) at the helm, in third; and, Sam Chan racing Noisy Forefather (Hong Kong) came in fifth. The remaining top nine places were all taken by Etchells: Nick Burns sailing for England in Gunga Din headed the Etchells’ list in fourth place, followed by: Dinkum Quest sixth (Australia); Mac Farquhar’s Folly seventh (Scotland); Shrub aka Kraut eighth (Deutschland); and Easy Tiger ninth (England). Big Boats missed out in this race, but Fred Knimonth’s MacMandrake (EFG Bank Mandrake for Ireland) headed the Big Boat list in 10th spot, followed by BushWaka (Ambush for New Zealand), then Peninsular Signal 8 and FfreeFire (Australia/England). But the Big Boats completed the course in the shortest elapsed time with FfreeFire clocking at 2:09:48, followed by Signal 8, BushWaka and MacMandrake. 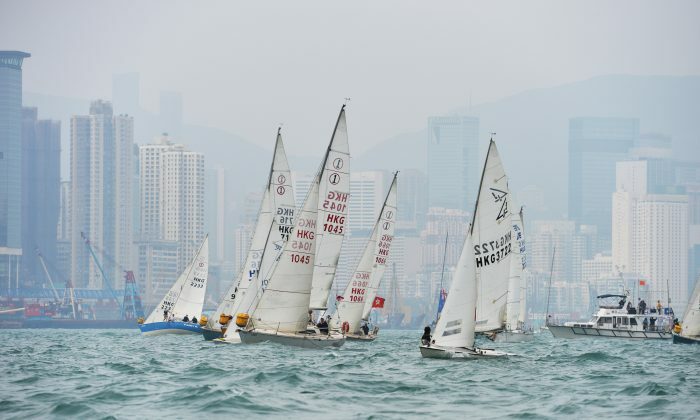 The race started with promising wind conditions in the harbour, but the wind lightened in the harbour’s outer reaches beyond Lei Yue Mun Gap, however all boats except three finished the race.